Borneo (Kalimantan) is the third largest island in the world (after Greenland and New Guinea) and is now divided among Brunei, Indonesia (former Dutch Borneo) and Malaysia (former British Borneo). 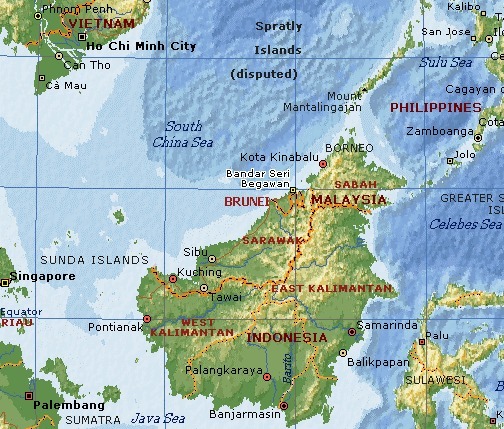 Approximately 3/4 of Borneo is Indonesian. 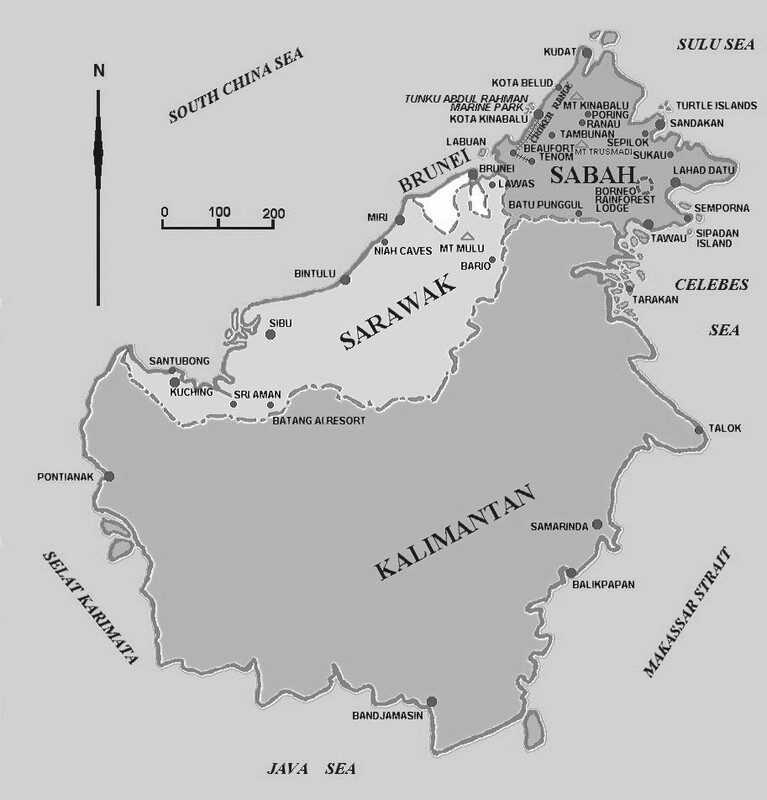 The Malaysian states of Sabah and Sarawak occupy the other 1/4 of the island. In 1824, the British and Dutch governments signed the Anglo-Dutch Treaty to exchange trading ports which split Borneo into British and Dutch controlled areas. In 1878 Sultan of Sulu, leased North Borneo to the British North Borneo Company in what is now Sabah. 1842, the British were granted large parts of Sarawak. During World War II, the Imperial Japanese Navy (IJN) controlled the former Royal Dutch Shell oil fields and refineries at Miri, Seria and Lutong, near Brunei, Sarawak in northern British Borneo, Kuching and Pontianac on the west coast and at Sandakan, Tarakan, Samarinda, Balikpapan and Bandjermasin along Dutch Borneo’s eastern and southern coasts. The facilities were operated by Japanese civilian and local national technicians. In Sarawak (British Borneo), the oil fields were at Miri and at Seria in the State of Brunei, 32 miles north. The crude oil was pumped from both fields to a refinery at Lutong on the coast near Miri, from which loading lines ran out to sea. In August 1941, with war clouds gathering over the Pacific, the British implemented a scheme which reduced the output of oil by seventy per cent. They also decided that in event of war, no attempt should be made to defend North Borneo, Brunei or Labuan. In December 1941, after the attack on Pearl Harbor, the British ordered the total destruction of oil fields and airfields at Miri and Seria. Orders for the demolition of the refinery at Lutong and the oil wells reached Miri on the morning of 8 December 1941 and their destruction was completed that evening. At 0500, 16 December 1941, MajGen Kawaguchi Kiyotake's 35th Infantry Brigade’s 18th Division and the No. 2 Yokosuka Special Naval Landing Force (SNLF) landed on British Borneo and captured the oil fields at Miri and Seria and the refinery at Lutong. The Japanese followed up with landings at Kuching on 24 December, Jesselton on 8 January and Sandakan on 17 January 1942. On 11 January 1942, MajGen Sakaguchi Shizuo’s 56th Mixed Infantry Group consisting of the 146th Infantry Regiment, units of armored vehicles, field artillery, engineers and medical service and the No. 2 Kure SNLF landed on Tarakan island. Prewar, Tarakan’s Pamoesian and Djoeata oil fields produced 6,000,000 barrels annually. The outnumbered Dutch destroyed the 700 oil wells on Tarakan to prevent Japanese use. The next day, in retaliation for sabotaging Tarakan's wells, Japanese troops executed captured Dutch prisoners-of-war (POWs). On 18 January 1942, the Dutch began destroying oil facilities at Balikpapan. At 0700, 19 January 1942, the Japanese landed unopposed at Sandakan, British North Borneo. During the night of 23-24 January 1942 MajGen Sakaguchi’s 56th Mixed Infantry Group and the No. 2 Kure SNLF landed in Balikpapan and occupied the town and oil refineries without resistance. The next month, on 20 February 1942, the Japanese massacred 72 Dutch POWs and two Dutch civilians at Balikpapan for destroying the oil facilities there prior to the occupation. On 10 February 1942, Sakaguchi’s 146th Infantry Regiment's 3rd Battalion also captured Bandjarmasin, the capital of Dutch Borneo, unopposed. The refineries on Borneo were estimated to supply Japan with up to 35 percent of her refined petroleum products and more than half of that used by Japanese forces in the Philippines. The Balikpapan refining and oil center was second only to Sumatra's Palembang in production. Allied Intelligence estimated that Balikpapan refineries processed 5,240,000 barrels of crude oil annually and produced aviation gasoline, diesel and motor fuel, kerosene and lubricating oil. Balikpapan’s Pandansari refinery, “the Ploesti of the Pacific”, was a new and modern plant essential to distillation of aviation gasoline and its Edeleanu plants produced sulphuric acid for the solvent treatment of aviation gasoline. The oil fields on Tarakan island produced 350,000 barrels of crude per month. Borneo crude oil was light enough to be burned directly in ship's boilers, without refining, but when the Imperial Navy turned to this expedient late in the war, they found that the sulfur content was high enough to make boiler steel brittle, eventually ruining the boilers. A few hours after Pearl Harbor, President Franklin D. Roosevelt approved a message authorizing Pacific commanders to “Execute Unrestricted Air and Submarine Warfare Against Japan.” On the first day of the war, American submarines based in Pearl Harbor, Hawaii and the Philippines took the war to Japan, beginning an anti-shipping campaign. In 1942, submarines inflicted 72 percent of Japan’s shipping losses, but initially the campaign was unfocused, and aimed to maximize tonnage sunk regardless of ship type. This led submarines to sink only 9,000 tons of tankers (1.3 percent of total sinkings) with only slightly better anti-tanker activity through most of 1943. As a result, the Japanese began increasing both their tanker tonnage afloat and their imports of Dutch East Indies oil. The campaign against Japan’s oil supply was aided by loss of the 14,503 ton Army transport TAIYO MARU (ex-German liner CAP FINISTERRE) to an American submarine. At 1200, 7 May 1942, TAIYO MARU departed Mutsure, Japan for Singapore carrying a large number of oil field technicians to revive the refining facilities at Miri and Balikpapan and other technicians bound for Palembang, Sumatra. She also carried 34 soldiers and 1,010 civilians including military governors, doctors, staff, educators and technicians needed to administer conquered Southeast Asian regions, but at 1945, 8 May, LtCdr William A. Lent’s (USNA ‘25) USS GRENDADIER (SS-210) torpedoed TAIYO MARU 80 nms from Me-Shima Lighthouse. At 2040, TAIYO MARU sank. 656 of 1,044 passengers, four of 53 armed guards/gunners and 156 crew were KIA (total 817). The loss of the oil technichians undoubtedly delayed the Japanese in restoring oil production capacity. Late in 1943, the United States Navy made tankers the top priority target for submarines. 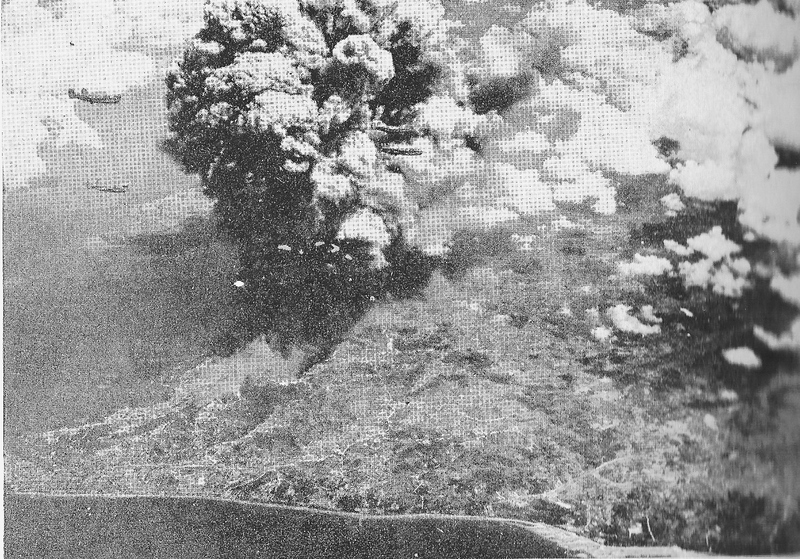 Bomber attacks on Dutch East Indies oil refineries also aided the blockade by eliminating Japan’s capability to supply military refueling stations with refined product directly from the East Indies. By forcing the Japanese to ship crude oil from the East Indies to home island refineries first--before it could be delivered to consumers--these attacks increased Japan's tanker requirements, with a resultant rise in sinkings. Yet, despite these successes, USAAF leaders committed less than two percent of their sorties toward maritime missions. LtGen George C. Kenney, CG of the USAAF Far East Air Forces’ (FEAF) chafed to attack the lucrative oil field targets on Borneo, but the distance from his existing South West Pacific Area airfields to targets in Borneo exceeded the range of Kenney’s longest ranged heavy bomber, the Consolidated B-24 “Liberator”. In November 1943, the Combined Chiefs of Staff met at Cairo, Egypt. 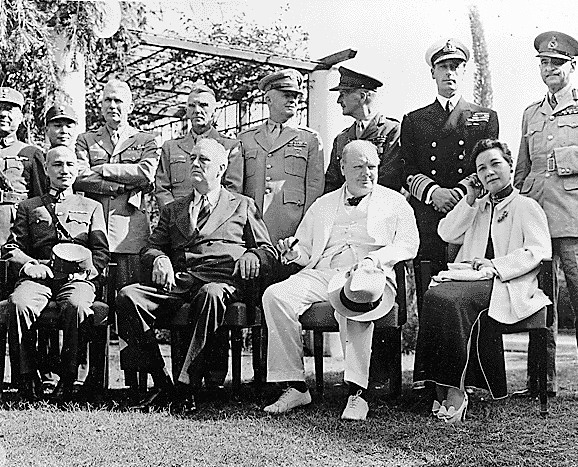 The Cairo Conference (codename “SEXTANT”) was attended by President Franklin D. Roosevelt of the United States, Prime Minister Winston S. Churchill of the United Kingdom, and Generalissimo Chiang Kai-shek of the Nationalist Republic of China and the British and American Combined Chiefs of Staff. The purpose of the meeting was to address future military operations against Japan. One of the important agreements made is to inititate very long range range (VLR) bombing of vital targets in the Netherlands East Indies in 1944. Because of the importance of its oil fields, the American Joint Chiefs of Staff urged their British counterparts to move on Borneo and some planning took place for an offensive out of Darwin. However, by July 1944 the British dropped these plans in favor of participating in the invasion of Kyushu scheduled for late 1945. LtGen Kenney, armed with the “SEXTANT” planning paper, urgently requested the USAAF to assign to him some new Boeing B-29 “Superfortress” heavy bombers so that he could initiate attacks on Borneo from a base he prepared at Darwin, NW Australia. Kenny’s request was supported by both Admiral Nimitz and Gen MacArthur, but USAAF CG, Gen Henry H. "Hap" Arnold's position was that such missions were diversions from the bombing of the Japan's homeland and refused to commit the B-29s for use in the oil blockade. Kenney would have to wait almost another year until Allied ground forces secured bases within his B-24s range. In September 1944, the island of Noemfoor (Biak, Papua New Guinea) was captured and two 7,000 foot runways were completed at Kornasoren air field. Only then did Balikpapan come within the extreme range of the B-24J bombers of LtGen Kenney's 13th and 5th US Air Army Forces. Finally, from 30 September-18 October 1944, Kenney began a series of five raids, striking various targets at the Balikpapan and Lutong complexes. On 30 September 1944, 64 B-24s of FEAF’s Thirteenth Air Force’s 5th and 307 Bomb Groups (BG) and Fifth Air Force’s 90th BG struck oil installations at Balikpapan dropping 85-tons of 1,000 lb bombs. The 5th BG’s bombers damaged the Pandarsarii refinery and set afire an oil tanker at dock. Fifth Air Force’s 90th BG “Jolly Rogers” and the 307th BG arrived late, found the target obscured by cloud cover and did not put bombs on target. On 3 October 1944, 40 B-24 “Liberators” of Thirteenth Air Force’s 5th BG and 307th BGs flew unescorted missions against Balikpapan. They dropped 50-tons of bombs that damaged the Pandarsari refinery, lubricating oil refinery, cracking and sulphuric acid plants and oil storage tanks. Eighteen B-24s also bombed the Edeleanu plant. Seven B-24s were lost as were 24 Japanese fighters. On 10 October 1944, 106 B-24s of 5th BG hit oil refineries and an airfield at Balikpapan. Thirty-six escorting Lockheed P-38 “Lightning” fighters claimed more than 30 Japanese fighters shot down. On 14 October 1944, 101 B-24s escorted by Republic P-47 “Thunderbolt” fighters and P-38s again bombed oil refineries and associated industries in Balikpapan. 43 Japanese fighters were claimed shot down. On 18 October 1944, more than 120 B-24s and fighters launched a major strike on Balikpapan, but the strike was curtailed by bad weather. Only eight B-24s and eight P-38s reached the target. In the five raids, Fifth and Thirteenth Air Forces put 321 B-24's over Balikpapan, dropped 433.3 tons of bombs, and provided 66 P-38's and 30 P-47's as cover. During the raids, 22 B-24's, three P-38's, and six P-47's were lost, but USN and USAAF PBY “Catalina” float patrol planes saved 44 crewmen. Submarine USS MINGO (SS-261) rescued 16 B-24 crewmen shot down off Balikpapan; six from rubber rafts in Makassar Strait and the other ten from a beach on Celebes Island. To reach the gasoline and oil refineries at Balikpapan, the "Liberators" had to fly a round trip of 2,610 miles entirely over water and Japanese held territory, the longest daylight mass formation bombing missions ever flown by B-24 aircraft. The five raids stopped production at Balikpapan's two refineries and paraffin plant for almost six months. The Pandansari refinery was put out of action, but could be repaired; the Edeleanu plants required complete rebuilding; installations producing diesel oil and lubricants were damaged, but could be repaired quickly. With Balikpapan gone, the Japanese shifted to maximizing refined output from the Lutong complex, near Miri. In December 1944, 13th Air Force B-24s conducted a series of raids to seal off Lutong. Predation by aggressive young American submarine commanders on Japan's tanker fleet, coupled with B-29 "Superfortress" heavy bomber and British carrier attacks on Sumatra's oil fields and refineries, caused Japan’s oil supply to dwindle and its reserves reached emergency levels by the end of 1944. In early 1945, another series of air raids destroyed Balikpapan's plants completely. These attacks virtually eliminated Borneo as a source of oil and it never again contributed to the Japanese war effort. By April 1945, oil imports dried up almost completely. On 1 May 1945, the Australian 26 Brigade launched Operation "OBOE I" with a landing at Tarakan. "OBOE II " was conducted by the Australian 9th Division, which seized Brunei on 10 June and Miri on 20 June 1945. On 1 July 1945, "OBOE VI", the Australian 7th Division conducted the last amphibious operation of the war and seized the wrecked facilities at Balikpapan.